Since traveling can involve quite a bit of discomfort, you at least want your clothes to feel pleasant, and the perfect pair of women’s travel pants can do the trick. 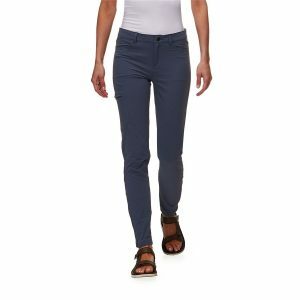 For most women, not only do travel pants need to be unbelievably comfortable; they should also be durable, fashionable, lightweight, and wrinkle resistant. Pockets that can fit a passport or phone are essential, and being versatile enough to be dressed up or down and easy to keep clean are another huge plus. From skinny to cargos to relaxed joggers we have found some of the best all-around styles for exploring the world. The Prana Meme is generally considered one of the best, if not the best travel pant, period. Prana’s makes the Meme using its “Zion Stretch” material which is quick drying, moisture wicking, durable and long-lasting. The stretch is the key to comfort in this style as it gives you a good range of movement, but it keeps its form well and doesn’t get saggy. The material is also fantastic because it can be brushed or wiped off easily if it gets dirty. The 97% nylon of the Zion Stretch means it won’t shrink over time and hardly shows any wear, even after years of use. The Meme is a skinny cargo design with back pockets and thigh pockets, which can be a hard design to pull off successfully. Pockets are often a key feature in getting a functional travel pant so you can carry all of your essential. 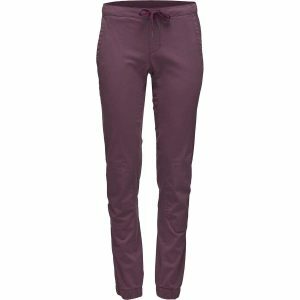 If you aren’t a fan of the pockets you should check out the Briann or the Halle also from Prana that uses the Zion Stretch, they just don’t have the pockets on the thigh. The Athleta Featherweight Stretch™ Skyline is another super attractive, comfortable option that works well for trips. The Skyline is very flattering and looks good in casual or dressy situations due to the cute bow at the front. The lightweight fabric is easy to pack without it getting wrinkled, and it works well for different types of climates or temperatures. It has two decent sized front pockets that are quite deep so you can feel your items are secure, but they don’t add a lot of excess to the overall form. They also come with a back pocket with a snap. One other interesting thing to note about the Skyline is that Athleta makes it from Recycled Poly, which is a fabric made from post-consumer plastic bottles, so they are environmentally sustainable. The material is what makes this an excellent traveling design since it is super lightweight and stretchy for all-day comfort. You may also want to consider the Athleta leggings, as a lot of women also love the comfort and fit of the leggings for traveling. Lolë have two fantastic options that work perfectly for long journeys. First is the Lolë Travel Pant. For many women, these Lolë pants are the perfect design to take with you on any vacation. They are stretchy, look great, last forever, have functional pockets with zippers, are easy to clean, and dry fast. The other key features to the popularity of this style are that it works well for a range of different temperatures, won’t wrinkle, they are light, and they dry quickly. The other Löle style you should check out is their Gateway Pant. These are super durable as you can wash and wear it repeatedly and it hardly shows any wear at all. They are breathable, comfy and have zippered pockets that don’t add much in the way of bulk. They are quite an understated look, so they blend into all kinds of situations, although they are a little more on the casual side. 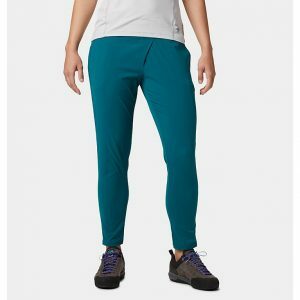 If you are looking for a stretchy and comfortable vacation pant in a skinny fit, the Women’s Patagonia Skyline may be the style for you. They are fantastic for all types of activities like hiking, being on a plane, or just running errands because the material is light and stretchy, so it is pleasant to wear. The slim fit means that they look fashionable if you need them for a slightly dressy situation like going to a restaurant in the evening. A lot of women find that the waistband fits a little big, but it has a drawstring that allows you to adjust the sizing. The other great thing about this design is that you can get them dirty and the water-repellent fabric means that you can brush them right off or wet them a bit for cleaning and they are good to go almost right away. 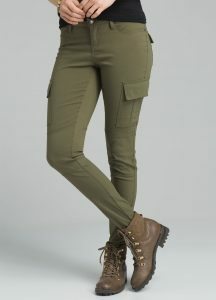 The cargo pockets have zippers to keep your items secure, and they also have zippered cuffs to adjust the bottom of the leg depending on what kind of footwear you are wearing. The North Face Aphrodite 2.0 is a technical hiking design that works well for long journeys due to the durable, breathable, quick-dry fabric that has a bit of stretch. They are a straight fit with a drawcord at leg opening; the fit is quite flattering due to the slight ruching on the side that looks good and also gives you freedom of movement. They come with two hand pockets and a zip pocket that lets you securely store your phone and passport. The Aphrodite is known for being warm, soft, and breathable. You can get them in capri or full length, and they look good with all kinds of footwear from sneakers to sandals. Despite being a warmer pant, the fabric is lightweight and easy to pack into a suitcase. The only downside to this style is they are a bit too casual if you need an option you can dress up. Eddie Bauer has a whole line of styles made for travel called Travex. The Travex line comes in a range of fits, sizes, and fabrics. Most designs in the line have all of the features that you need in a useful travel style: they are easy to pack, have stretchy easy to clean fabrics that aren’t too loose, and the pockets are the right size to fit your essentials. This line also creates designs that work well for dressing up or down and don’t need any ironing after coming out of a suitcase. Pay attention to the weight of the fabric on any styles that you are interested in; some of the Eddie Bauer options are made with quite a heavy material that won’t be suitable for more temperate climates. The Lululemon On The Fly is one of the most highly recommended options for traveling due to its versatility. 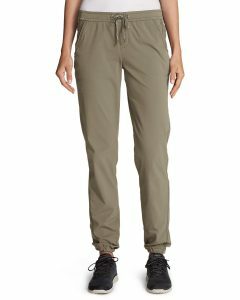 Women love these pants for all kinds of activities, but they are great for bringing along on your next vacation. They use Lululemon’s Luxtreme® fabric that is known for being super stretchy, and excellent for sweat-wicking and keeping you cool. These are a fantastic all-around option due to the light and silky feel of the Luxtreme® that comes in a nice variety of colors. 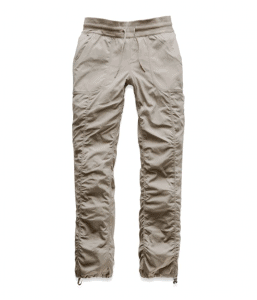 Overall the On The Fly style is a phenomenal pant that offers excellent coverage and support. Dynama™ Ankle is another hiking style that works well as a travel pant. It has the stretchy material for comfort and this style is also known to be very flattering on most body types. They are fantastic to take on a trip since they pack well with minimal wrinkling and they look equally suitable for hiking or everyday wear. You can get the Dynama in ankle or full length, and they look stylish with a wide range of different shoe options from hiking to flats. The Nylon-Spandex is the perfect weight for both hot, and cold climates and it also repels water and most dirt and debris, so it is easy to keep them clean. The other favorite feature of the Dynama is the large zip pockets are big enough to hold everything you need. 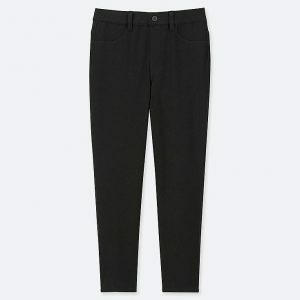 Uniqlo makes a fantastic all-around pant that is stretchy and very comfortable for whatever the situation. They come in a few different colors and have a very flattering fit. They are kind of a jegging, so you have the pockets at the front and the back, but they feel like a legging to wear. 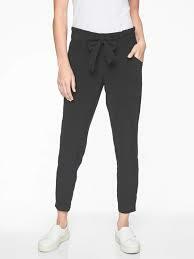 The Legging Pant also wash and wear well, I have a few pairs of the black that I have been wearing for at least a year now, and they have had no fading or piling. They are also very versatile and are easy to dress up or down. If you are looking for a cotton style, The Black Diamond Notion is well worth a look. The cotton is somewhat unusual though because it repels water, I’m not exactly sure how this cotton is made so that it doesn’t absorb water, but they are very soft and breathable. The Notion also has a cooling effect and dries quickly if it gets wet, so it makes an excellent hiking pant. The waistband and the cuffs are elastic, which is always a great comfort feature to look for in pants. It has two hand pockets and two rear pockets while maintaining a slim fit. The Notion is generally known for being stretchy, durable, and easy to keep clean because they repel dirt. The Columbia Women’s Anytime Outdoor Boot Cut Pant is a much-loved style that is perfect for most indoor or outdoor activities. These are fantastic design for traveling and hiking since the fabric is a lightweight, dries reasonably fast, and is wrinkle resistant The 96% nylon and 4% Elastane Summiteer Lite materials is a 2-way stretch that makes them comfortable, it is also resistant to stains, rain, and UV rays. They have a zipper, a snap and a string tie at the waist for adjustability. 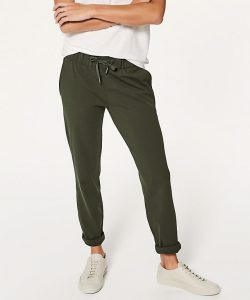 Overall these pants have a reputation for being cool, easy to move around in, easy to wash and wear and convenient to pack because they take up very little space. The Skyler from Anatomie is our last, but by no means least, pick. The Skyler is made from a lightweight sport fabric (92% Polyamide / 8% elastane) that dries relatively fast and is wrinkle resistant, they also pack up very small and take up hardly any space in your luggage. The fit is slim and slightly high-rise so that you can dress The Skyler up or down depending on the situation. The material on the Skyler is quite thin, so it is perfect for temperate climates but probably not the best option if you are looking for heavy warmth. Other than comfort, there are a few other features you should look out for when finding the perfect traveling clothes. Pockets– Pockets are an essential feature on travel styles (unless you prefer leggings). It is useful to have deep enough pockets to quickly and easily store your passport or phone as you move through airport security and need your hands available. With pockets, you may also want to look for styles that have a zipper or another kind of closure for extra security. Fit– You can get fits from very baggy to skinny or legging type fit, everyone obviously has a preference for the kind of fit they like best and feel the best in. Stylish– It is possible to get a style that is both functional and fashionable. The Prana and the Anatomie options are both very fashionable and as well as being super functional. Cleaning– Pants that are designed for travel are usually made with a quick dry fabric. The reason for this is so that you can wash the garment in a sink and leave it to dry overnight. If you can dry the clothing quickly, it means that you can pack less and still have no worries about having clean clothes to wear on your trip. Lightweight– Travel pants tend to be a lightweight fabric so they are fresh and comfortable when you are in temperate climates. If you are heading to colder places, you will want to look for a thicker fabric. A couple of options if you need a heavier garment are the Mountain Hardwear Dynama or the Athleta Skyline. Water Resistant– When a material is water resistant it is also often stain resistant and means that that you can usually brush off or wet and clean with a damp cloth any stains that occur. Packable– A good style is also easy to pack (when you unpack there are no wrinkles), and it doesn’t take up much space in your suitcase or bag. Dressed up/down – The best travel pants are also versatile enough to be dressed up or down. If you only have room for one pair on a trip, you need to be sure they are suitable for any kind of situation you may find yourself in.